We often get asked how we got into this farming thing. Here’s an article that does a good job of explaining that. This was done in year 3 of our farming venture. (We’re now in year 10!) This was done as a Land Stewardship Project, Farmer Profile. Ag physics question of the day: What happens when an object in motion meets an immovable force? First, meet the object in motion: “I just felt I needed to farm. I had this undying need to farm,” recalls Jody Lenz emphatically. Today the Lenzes are in their third year of Community Supported Agriculture (CSA) farming — a system where eaters buy a “share” in a farm and in return get a weekly delivery of naturally raised produce throughout the growing season. CSA farming is not like raising corn or soybeans—it’s the kind of endeavor where you not only have to raise the food, but become the face behind that food for the people who consume it. They’ve purchased a former dairy farm near the western Wisconsin community of Star Prairie, established a walk-in cooler in the garage for vegetables and are planning on using the ruins of a dairy barn as the basis for a new greenhouse. Mike, 40, is still working as an engineer (he is a project manager for a sheet metal fabricator), but he and Jody are already planning on how they can make farming a full-blown career for both of them. “I’m ready to be a fulltime farmer,” says Mike. What happened? The immovable force began to give a little a few years ago when the couple took the Land Stewardship Project’s Farm Beginnings® course. “I went kicking and screaming to the first class,” says Mike on a frigid day in early April while sitting in the couple’s kitchen, surrounded by their three children: Jonas 2, Malcolm 5, and Claudia, 7. Well, maybe not the hippie-freak part. But Mike admits he was hooked by the course’s focus on practical, hands-on financial planning, and impressed by the diversity of backgrounds the other students represented. He came out of that class officially a wannabe farmer. Twice-a-month during the winter of 2006-2007, the Lenzes made the six-hour round trip from western Wisconsin to Winona in southeast Minnesota for the Farm Beginnings course. During the course, established farmers and other ag professionals shared insights on low-cost, sustainable methods of farming. The course also provided workshops on goal-setting, financial planning, business plan creation, alternative marketing and innovative production techniques. In addition, class participants had an opportunity to network with established farmers and utilize them as mentors. Jody, 35, grew up on a dairy farm in northeast Wisconsin but, like many farm kids, the yen to get back to the land didn’t strike her until she had started another career. After leaving the home farm she went to college and became a teacher. “I didn’t really consider farming an option,” she recalls. But while teaching at a school near her hometown, she worked on an uncle’s dairy operation and got bit by the agriculture bug. She and Mike eventually married and Jody got a job teaching in western Wisconsin. But she never lost that passion for getting back to the land. She eventually met Margaret Pennings and Dan Guenthner, who operate Common Harvest, a pioneering CSA farm in the region. 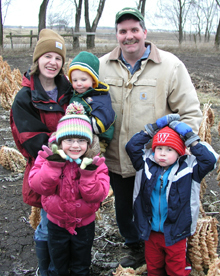 Common Harvest has hosted Farm Beginnings field days in the past, and Guenthner recommended the Lenzes take the class. “I just had to do something to deal with this desire to farm, even if it was just take the Farm Beginnings class,” says Jody. She was committed to the course despite what she and Mike call the “unending list of reasons not to take the class.” Namely, Jody was pregnant with their third child, attending the class required a lot of hours on the road and it began during hunting season (a major downside for Mike, an avid outdoorsman). Oh yeah, and then there was the issue of Mike’s less-than-enthusiastic desire to become an agrarian. “We did a tremendous amount of business planning on that drive to Winona,” says Mike. Before taking the class, the Lenzes didn’t know what farming enterprise they wanted to pursue. But they had always had a big garden and the class helped the couple decide that CSA farming was a good fit for them. For one thing it appeared easier to work with on a trial basis than say, raising livestock. Since graduating from Farm Beginnings, they’ve dipped their toes into the CSA farming system gradually. While still living in town during the summer of 2007, they plowed up their own yard as well as a neighbor’s, and sold 10 shares in their trial CSA for $100 a piece. That went well so they bought the former dairy farm (it was originally 160 acres, but the Lenzes bought 10 acres along with the house and outbuildings). During the summer of 2008 they doubled their CSA share offering and expanded their plantings. Things went well that first year on the old dairy farm, although they had a rough start to the season: a Memorial Day storm leveled a planting of brassicas. In their third season of CSA farming, the Lenzes are holding their membership at a little less than 40 for now, but plan on expanding to 100 eventually. They do deliveries to two nearby towns, as well as have on-farm pick-up for members. The family is active in their church, community and schools, and they want to extend that involvement to providing food to local people. “We really want our market to be in this area,” says Mike. “People out here need to eat good food too.” Their operation, Threshing Table Farm, is also a partner in Buy Fresh Buy Local Saint Croix River Valley, an LSP-led initiative in the region that is helping promote production and consumption of local foods. On this day in April, their customers are ready for a new season to begin. Toward evening a family pulls into the driveway to buy some eggs and drop off their first CSA check of the year. There’s a lot of pent-up energy present on the farm. The kids bike around in the mud under lead-colored skies. Canada geese wing overhead as the Lenzes check out plots full of last year’s tomato vines and kale. Click here to see the story on the Land Stewardship Project website. — A version of this article originally appeared in the Summer 2009 Land Stewardship Letter. For more information on LSP’s Farm Beginnings program, see www.farmbeginnings.org. More information is also available by calling 507-523-3366 in southeast Minnesota or 320-269-2105 in western Minnesota.